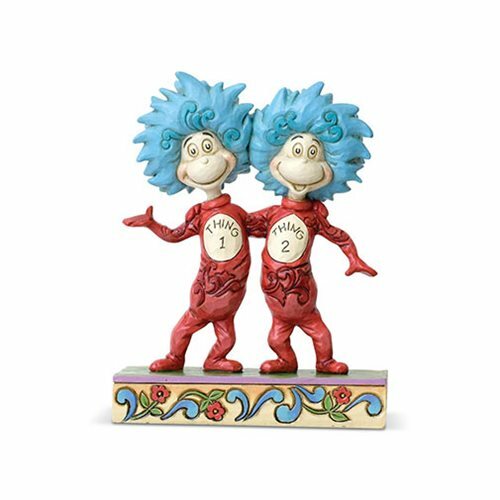 Thing 1 and Thing 2, the mischievous pair from the classic children's tale, The Cat in the Hat, stand cheerful on the edge of chaos in this fun-filled design from the imagination of Dr. Seuss and the artistry of Jim Shore. The dynamic duo pose side by side with impish grins, wearing their matching outfits embellished with Jim's signature folk art flourishes. Thing 1 and Thing 2 stand atop an intricately handcrafted base with colorful, floral motifs. The Dr. Seuss Cat in the Hat Thing 1 and Thing 2 Statue by Jim Shore is made of stone resin. Measures about 5-inches tall x 4 1/10-inches long x 1 3/4-inches wide.